While the Summer is ending and autumn is on its way, we are going to miss the awesome weather, holidays, BBQ’s and of course the summer foods. Of all the summer foods in the earth, I love mangoes. It’s vibrant yellow color and the flavor are irresistible. There are so many kinds with different colors, shapes, texture and taste. I have never seen anybody disliking it. Such a wonderful fruit on earth. Gosh If we get this fruit year around!! Although we can find mangoes other times it’s just not that delicious and moreover it will be expensive.. Being a daughter to a mother who had spent most of her living in Kerala where you find abundant mangoes and jack fruit during summer I have grown eating mangoes in every styles. 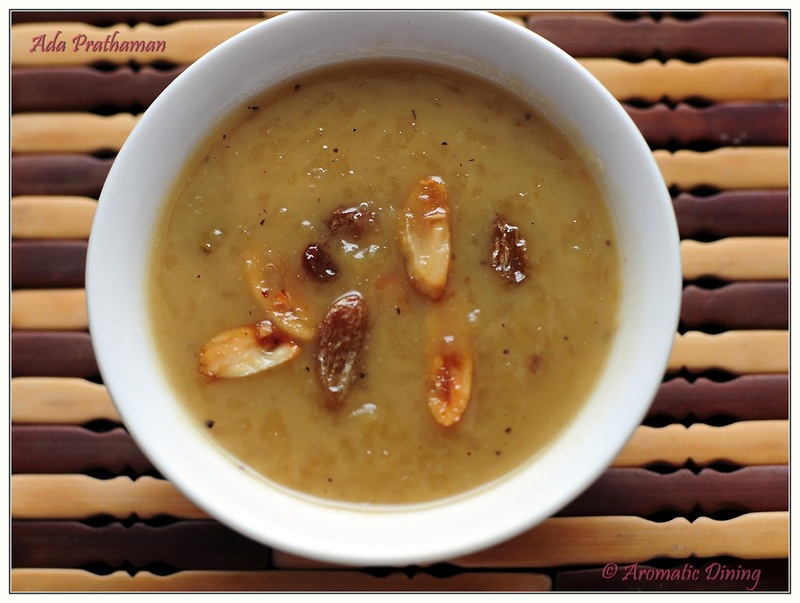 When we talk about unripe mangoes we find it as pickle, raita, chutney, salad or in curries. When it is ripened, it fits into beverages, desserts and also in curries. So divine!! Now You would have been wondering why I am late to post mango recipes. Yes! I agree. My bad! I was just eating myself and never thought of posting it. Then when suddenly mangoes vanished from market I started feeling something missing. While I was in that weird feeling last week I found huge mangoes lying on the market. Yay!! So with no time I grabbed few and already I knew where all these mangoes are going to be :). 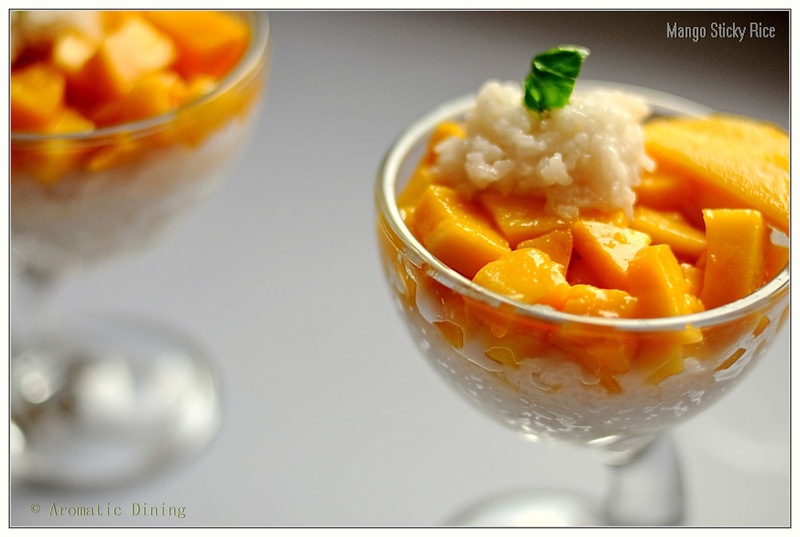 I have few mangoes recipes on draft which I will post in coming weeks. 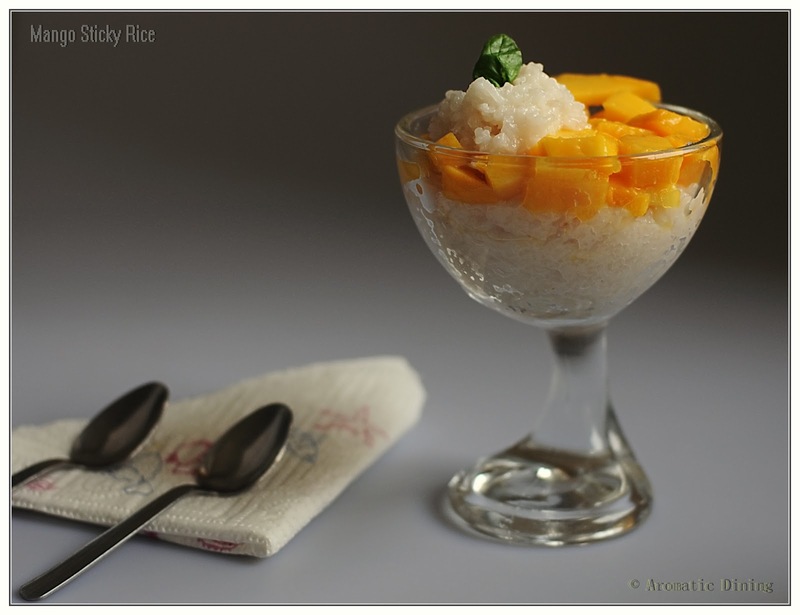 When I came across this Thai style Mango dessert I was so surprised ! 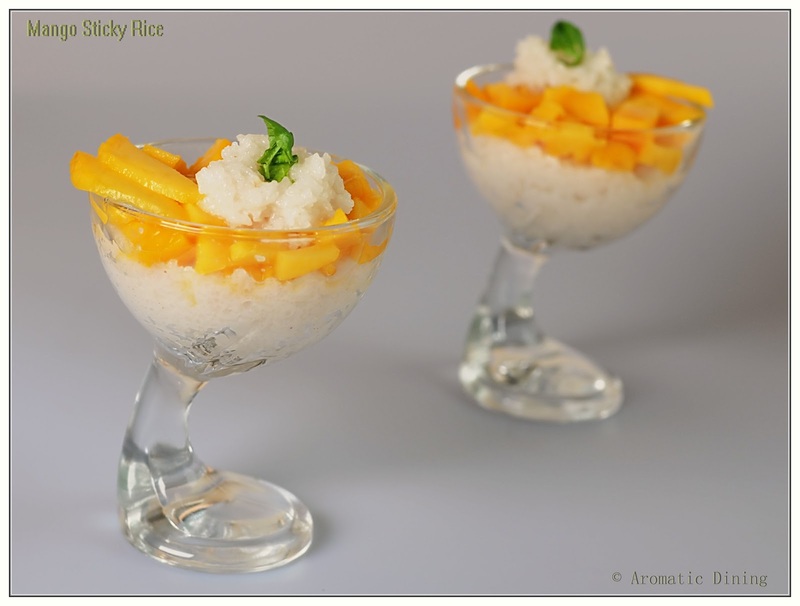 I have tasted this rice pudding somewhere in our India but the combination of mango with it is simply Luscious & Yum!! 1. Chop the mango into cubes for toppings and few lengthy strips to decorate. 2. Soak the sticky rice in water for about 2 – 3 hrs. 3. Mix sugar and salt with the coconut milk. 4. Traditionally the rice is cooked in sticky rice steamer or normal steaming method. (See Notes). add half cup of coconut milk. Reduce the flame and cook till the rice becomes soft and thick. turn off the heat. Set aside to cool and absorb for 10-15 mins. mangoes. Garnish with mint leaves or drops of coconut milk. 6. Serve warm or cold. about 30 mins. After taking out of steamer add the coconut milk to it. 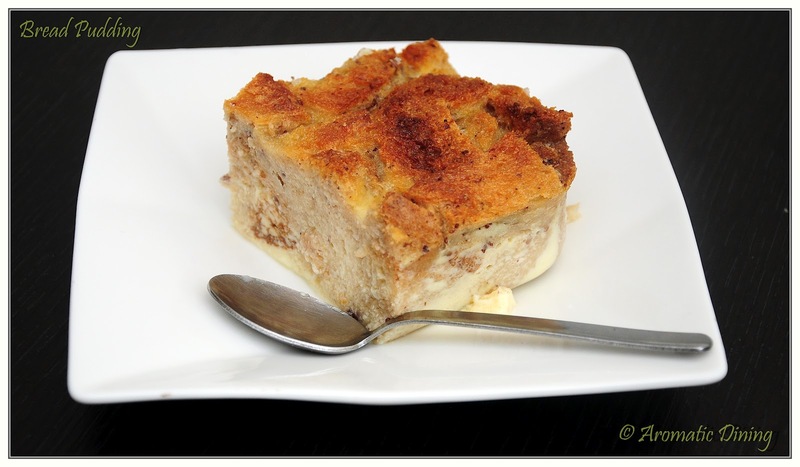 Bread pudding is my childhood favourite. I used to get this during X’mas from a dear friend of mine from school. He used to make it by himself and that too an amazingly perfect pudding. After schooling neither of us had time for it. I’d wrote him couple of months ago and asked for the recipe. I got the reply with his recipe card yay!! 🙂 Tnx dude! 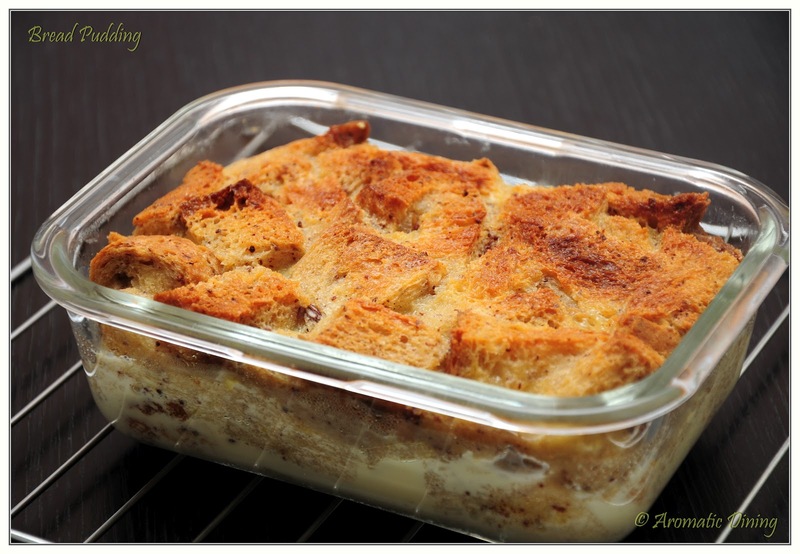 So now not wasting a single day I started making my bread pudding. Instead of steaming the pudding I have baked it. It turned out very well.. As good as original recipe..
Every spoon full is a bliss & satisfying memory. This scrumptious dessert is all what we need at the end of a busy day. Stretch, relax & start diggin in the pudding. Preheat oven to 175° C. Grease the baking dish with butter or oil. I have used 630 ml rectangular glassware. 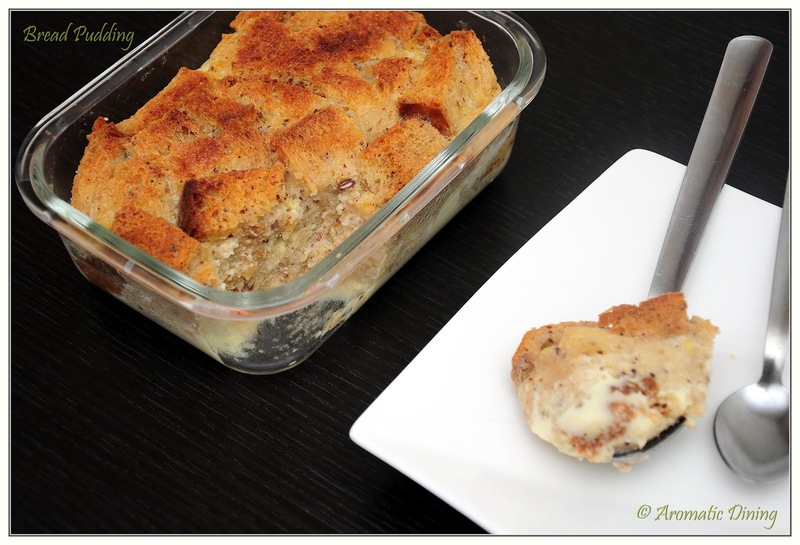 Tear the bread into small cubes and place it in the baking dish. In a separate bowl whisk together the egg, milk, sugar, cinnamon powder and butter (Room temperature) for 5-7 mins. Sprinkle the raisins on the bread and pour the egg mixture to it evenly. Press down the bread to soak well. Place the dish in the center of middle rack and bake for 45 mins or bake till when a toothpick inserted in the center of the pudding comes out clean. Cut to desire shapes and pieces. Serve warm with ice cream on the top. Serve chill with condensed milk (or) whipped cream (or) honey (or) chocolate syrup (or) any other toppings of your kind. 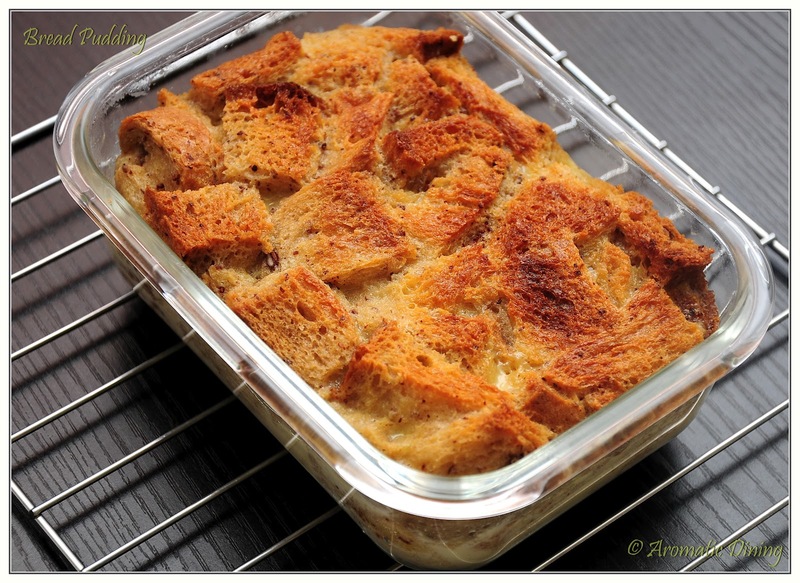 If you want to make simple pudding avoid bread pieces. Use all other ingredients. Not only raisins you can also use any dried fruits to the pudding.